At Clear’s Martial Arts, we believe that everyone deserves a long and healthy life, safe from harm. We are committed to making high-level martial arts secrets accessible to the public. We accomplish this with live teaching, instructional DVDs, and online training in Tai Chi, Chi Kung, and Self Defense. The mission of Clear’s Tai Chi is to fuel a revolution in Tai Chi Instruction based on the pursuit of function, not choreography, not philosophy. We want principles and methods that produce results, not just more techniques and sets. Sigung (Master) Richard Clear has studied Tai Chi and Chi Kung in the U.S. and in China. 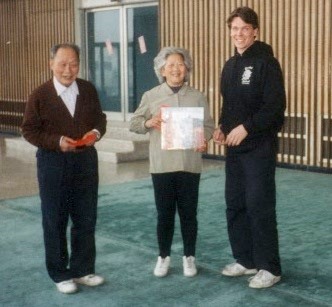 Master Clear Began his study of Tai Chi at a very young age after he was diagnosed with degenerative arthritis. He experiences no pain from the arthritis and is more supple than the average person half his age. Master Clear is a 3rd generation lineage holder in Tai Chi from Lee Ying Arng who was a senior student under Yang Chen Fu. Master Clear studied directly with such famous masters as Ma Yeuh Liang, Wen Mei Yu, Dr. Fred Wu, Liu Ji Fa, Ju Bong Yi, Pei Xi Rong, Willem de Thouars and Don Ethan Miller among others. Master Clear’s earliest Tai Chi teacher, Tyrone Jackson, was Dr. Wu’s senior lineage disciple. Master Clear began teaching Tai Chi in 1985 and has over 40 years of continuous study in Tai Chi, Martial Arts, Psychology, Philosophy, Alternative Medicine and Physiology. Master Clear’s Tai Chi has been featured in national magazines and on television. He has a practical teaching method rooted in the basics and knows both the healing and the martial side of Tai Chi and Chi Kung in depth. He holds a Masters Level (Si Gung) in Internal Kung Fu and is a senior instructor in several martial arts. Master Clear is known for the quality of his instruction and the sincerity with which he teaches his programs, always taking the extra time to work with those in need, in a dedicated effort to pass on the many benefits and rewards he has received from his lifelong study in this field. my name is jack wilson from michigan im 70 years old viet nam marine veteran ,health fair but problems ,would like to learn more on health n bealing benefits as well as self defense n power tenichnqiue ,and perhaps pass some knowledge to my grandaughters n sons thank you . But if you can’t make it to that, you can always get more of what you’re after from the Internal Power courses and the Healing programs.